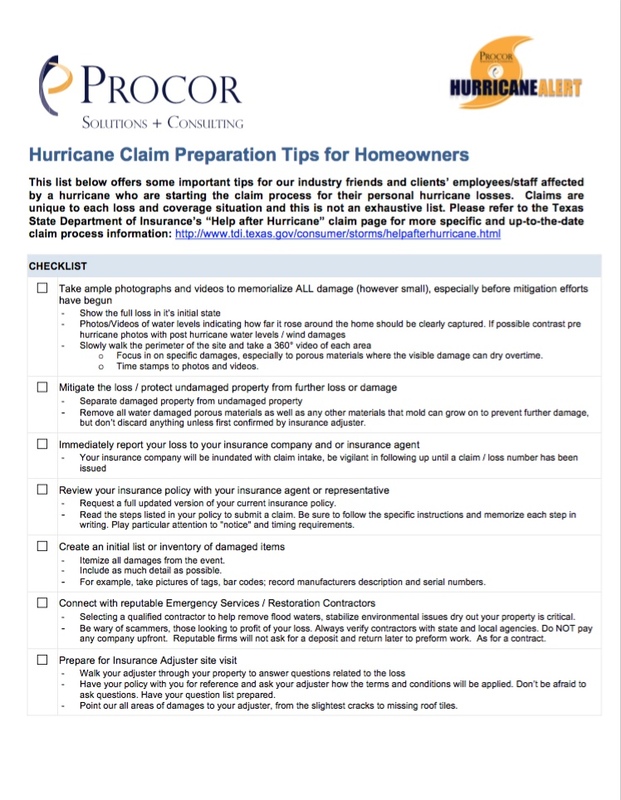 Procor founder and EVP, Frank Russo offers some important tips for our industry friends and clients’ employees/staff affected by the recent hurricane’s who are starting to review their own personal homeowner losses. Hurricanes have devastated many homeowners who are just now beginning to evaluate damages and review their insurance and FEMA funds available for the recovery. Bottom line, do not wait for the process to begin, you must lead it. The team at Procor focuses on helping businesses with commercial losses, however many of the same steps and procedures for a successful claim recovery apply to a homeowner property loss. 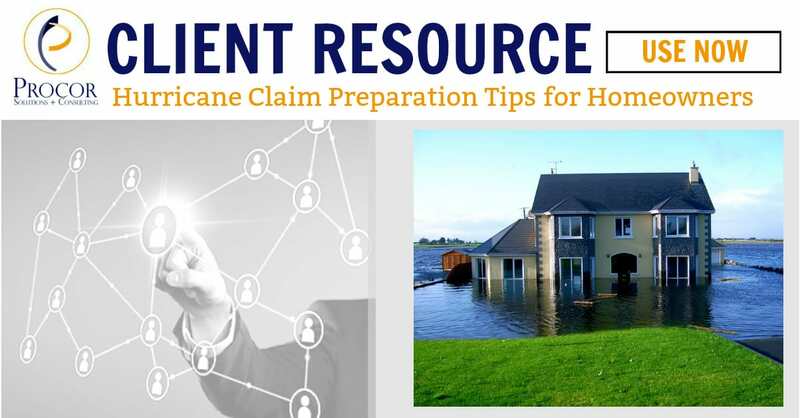 The following list offers some important tips for our industry friends and clients’ employees/staff affected by a hurricane and starting the claim process for their personal losses. Claims are unique to each loss and coverage situation and this is not an exhaustive list. Once cleared to return, be sure to wear protective gear and work boots. Request a full updated version of your current insurance policy. Many times Homeowners only have the most recent declaration of coverage pages and not the detailed policy itemizing what is or is not covered and to what amount. Read the steps listed in your policy to submit a claim. Be sure to follow the specific instructions and memorize each step in writing. Play particular attention to “notice” and timing requirements. You can not have too much evidence. As the claim adjustment ensues and time passes, pictures and video may be the reason a claim is ultimately paid or denied. Detail as possible. For example, take pictures of tags, bar codes; record manufacturers description and serial numbers. A qualified contractor to help remove flood waters, stabilize environmental issues, dry out your property is critical. Be wary of scammers, those looking to profit of your loss. Always verify contractors with state and local agencies. Do NOT pay any company upfront. Reputable firms will not ask for a deposit and return later to preform work. As for a contract. Procor maintain relationships with leading and respected restoration contractors. We can direct you to them. Include pricing receipts or internet research supporting the price of an item: For example, if you don’t have a receipt for your television, google the manufacturer brand and type and print a copy of the current price. Have your policy with you for reference and ask your adjuster how the terms and conditions will be applied. Don’t be afraid to ask questions. Have your question list prepared. Point our all areas of damages to your adjuster, from the slightest cracks to missing roof tiles. Ask for immediate funds. While you full claim will take months to be paid, the adjuster should have the authority to recommend a “partial payment” to help you jumpstart the recovery process. Within 24 hours after their visit, memorialize the visit in an email to the adjuster and copying your broker, agent, and/or insurance representative. The more detail, the better. As the claim process proceeds, critical items may be forgotten or misunderstood and those documented emails can be critical to establish the timeline of the claim. Gather estimates of repairs; while challenging due to the scope of hurricanes it will be important to get multiple bids for each damaged item. Track all extra expenses or additional living expenses and costs above normal related to the event. Any cost or expense incurred, that would not have been incurred “but for” the hurricane. If your policy provides coverage for alternative accommodations while your property is being repaired, focus on the time or dollar limit for those accommodations. Ask you insurance agent for support in the process. Be wary of scammers, those looking to profit of your loss. Always verify public adjusters with state and local agencies.